But I just think that McCain's problem is he's over 70, he's standing there with John Warner, who's much older than him. He's standing with Tom Davis, who's retiring. He looks like an army in retreat in Virginia. That's what it looks like tonight. The Virginia Republican party used to own that state. They could elect people that are not particularly likable. They were able to do that in the past. Now they're having a hard time even fielding a candidate against Mark Warner. WILLIAMS: Well, let's talk about that feeling Chris gets up his leg when Obama talks, for starters. OLBERMANN: No, no, no, no, no, no, no. WILLIAMS: That seems to be the headline of this half hour. MATTHEWS, laughing: Let it stand, then. Don't tread on it, Brian, if it's a good line. KEITH OLBERMANN: John McCain speaking after his three victories in the Potomac primaries tonight, from Alexandria, Virginia, to the tunes of Johnny B. Goode, instrumental only. And in a statement which I hope transcends political orientation and party affiliation and all that, I would think, Chris, as we start to analyze what we have heard here, the rule has to be, if you can, always speak before Barack Obama, not after Barack Obama. 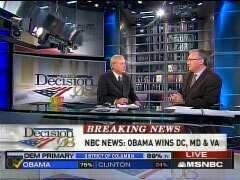 CHRIS MATTHEWS: I have to tell you, you know, it's part of reporting this case, this election, the feeling most people get when they hear Barack Obama's speech. My, I felt this thrill going up my leg. I mean, I don't have that too often. MATTHEWS: -to an audience of people who were very probably liberal and probably anti-Republican. He said this is an American hero I'm running against. And then, of course, he went in to delineate his differences with him. It shows a lot of class. I think there will be class if there is such a contest come this coming summer. But I just think that McCain's problem is he's over 70, he's standing there with John Warner, who's much older than him. He's standing with Tom Davis, who's retiring. He looks like an army in retreat in Virginia. That's what it looks like tonight. The Virginia Republican party used to own that state. They could elect people that are not particularly likable. They were able to do that in the past. Now they're having a hard time even fielding a candidate against Mark Warner. The former governor's going to run for that Senate seat of John Warner's, no relation, and it's going to be very tough for them. OLBERMANN: Where do we start with this? Brian, we haven't spoken to you tonight. Simply on the results here, are we clearer about where each of these primaries are going, how soon we will get to the nominees in both cases? BRIAN WILLIAMS: Well, let's talk about that feeling Chris gets up his leg when Obama talks, for starters. MATTHEWS (laughing): Let it stand, then. Don't tread on it, Brian, if it's a good line. Another Flag Issue for Obama?